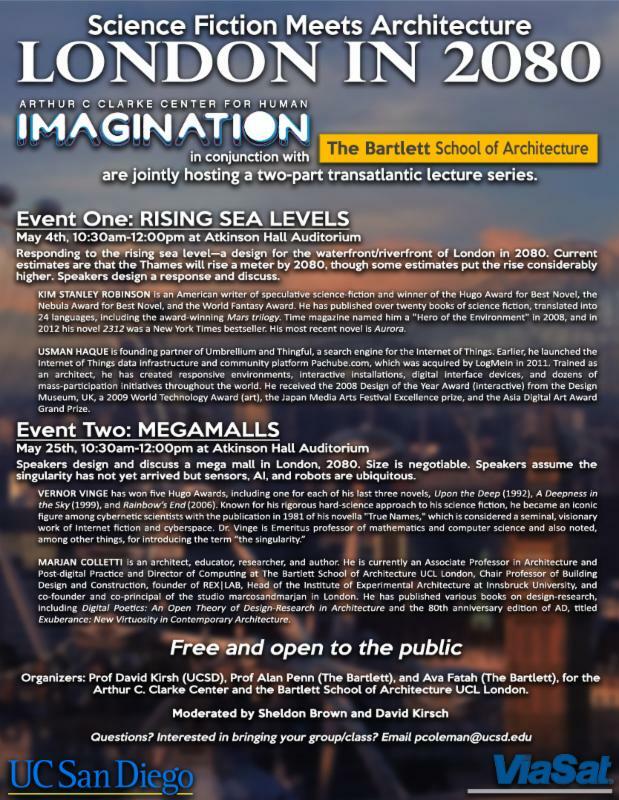 The Arthur C. Clarke Center for Human Imagination in conjunction with The Bartlett School of Architecture are jointly hosting “Science Fiction Meets Architecture: London in 2080”, a two-part transatlantic lecture series on designing for the future, free and open to the public. Responding to the rising sea level-a design for the waterfront/riverfront of London in 2080. Current estimates are that the Thames will rise a meter by 2080, though some estimates put the rise considerably higher. Speakers design a response and discuss. Kim Stanley Robinson is an American writer of speculative science-fiction and winner of the Hugo Award for Best Novel, the Nebula Award for Best Novel, and the World Fantasy Award. He has published over twenty books of science fiction, translated into 24 languages, including the award-winning Mars trilogy. Time magazine named him a “Hero of the Environment” in 2008, and in 2012 his novel 2312 was a New York Times bestseller. His most recent novel is Aurora. Usman Haque is founding partner of Umbrellium and Thingful, a search engine for the Internet of Things. Earlier, he launched the Internet of Things data infrastructure and community platform Pachube.com, which was acquired by LogMeIn in 2011. Trained as an architect, he has created responsive environments, interactive installations, digital interface devices, and dozens of mass-participation initiatives throughout the world. He received the 2008 Design of the Year Award (interactive) from the Design Museum, UK, a 2009 World Technology Award (art), the Japan Media Arts Festival Excellence prize, and the Asia Digital Art Award Grand Prize. Speakers design and discuss a mega mall in London, 2080. Size is negotiable. Speakers assume the singularity has not yet arrived but sensors, AI, and robots are ubiquitous. Marjan Colletti is an architect, educator, researcher, and author. He is currently an Associate Professor in Architecture and Post-digital Practice and Director of Computing at The Bartlett School of Architecture UCL London, Chair Professor of Building Design and Construction, founder of REX|LAB, Head of the Institute of Experimental Architecture at Innsbruck University, and co-founder and co-principal of the studio marcosandmarjan in London. He has published various books on design-research, including Digital Poetics: An Open Theory of Design-Research in Architecture and the 80th anniversary edition of AD, titled Exuberance: New Virtuosity in Contemporary Architecture. This entry was posted in Conventions and tagged Arthur C. Clarke Center for Human Imagination, Kim Stanley Robinson, Vernor Vinge by Mike Glyer. Bookmark the permalink. My first thought was “surely Vinge has published a novel since Rainbow’s End“. And I went and looked, and he has – Children of the Sky. Children of the Sky did not win a Hugo, nor was it one of the 5 finalists. Yes. That was my point. Look at the quote from the bio blurb: “Vernor Vinge has won five Hugo Awards, including one for each of his last three novels”. No, no he has not. His last novel did not win a Hugo. Sorry Aaron, I was not disagreeing with you, I was trying to further explicatorize that it did not even come very close to winning.